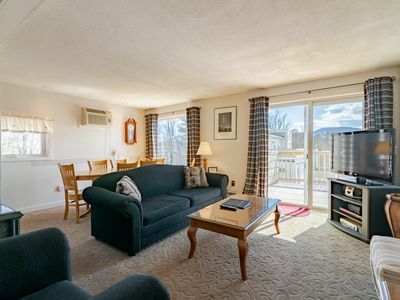 Our bright, cozy one bedroom apartment is a great spot to use as the hub for your vacation travels or to just relax. We're in a quiet country setting, yet close to area activities. Enjoy a soak in the Hot Tub! 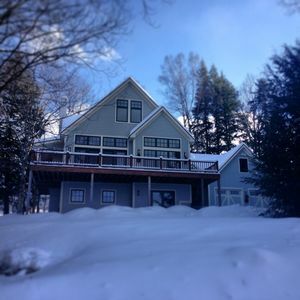 Conveniently located between Morrisville and Stowe, we're close to many dining options, some of the best breweries, hiking, skiing and snowmobiling in northern Vermont along with many other recreational and tourists activities. 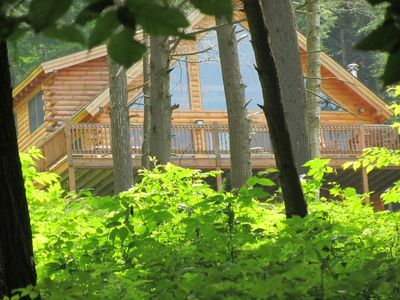 A great place to enjoy the beauty of Vermont. Our bright cozy apartment has a private covered entrance with porch and ample parking. 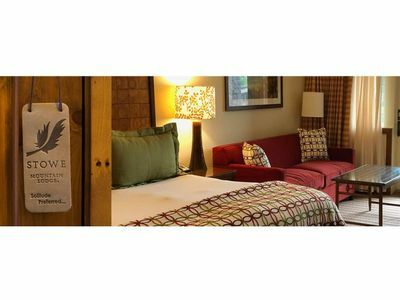 There is one bedroom with a queen bed and a queen pull out couch in the living room which offers accommodations for up to four people. The full bathroom has a tub/shower and washer/dryer for your use. 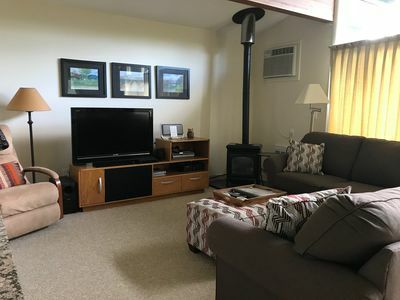 The living room has a Smart TV with local channels, Netflix, Hulu and more. Complimentary Wifi and cell service for most carriers. 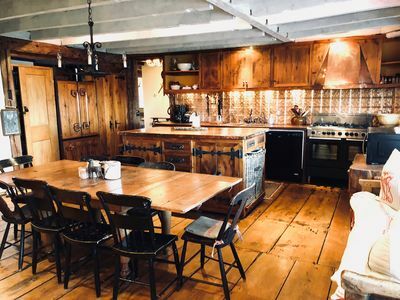 There is a full kitchen equipped with a range, refrigerator, microwave, coffee maker, toaster and a full compliment of cookware making it easy to prepare you own meals. The covered porch has a table and chairs along with gas grill for outdoor cooking and relaxation. 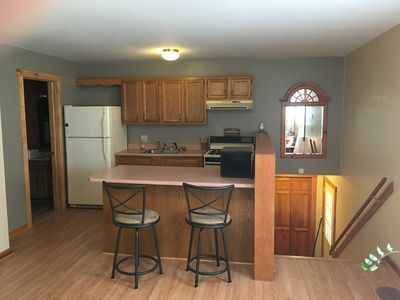 The apartment and porch offers privacy and a great view of the back yard and woods where guest often spot deer and other wildlife. 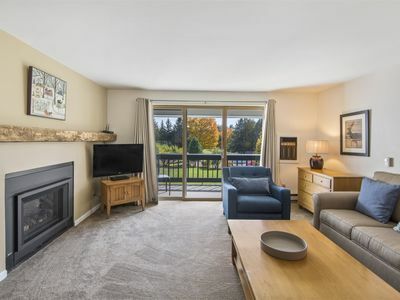 We're located just outside town in a quiet neighborhood where you'll find privacy, peace and quiet while still being close to shopping, dining, sport and recreational activities. During the winter the road is well maintained by the town which plows and sands regularly when needed. Well behaved pets are welcome on a case by case basis. Relax in the private hot tub located just steps from the door. 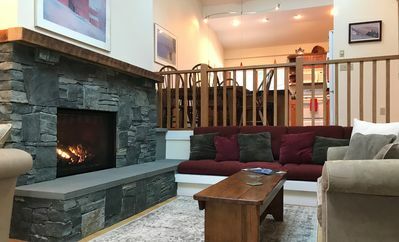 The back yard has a southern exposure for plenty of sunshine, a beautiful pond with a swim platform and dock, and a fire ring so you can sit around an evening fire while gazing at the stars. We'll even supply the wood. 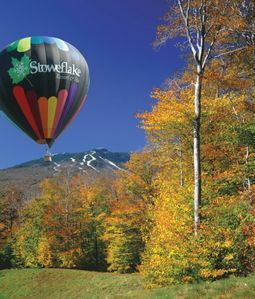 We are conveniently located between Morrisville and Stowe with all the activities of this great resort town. There are several miles of trails in close by for hiking, walking and biking. 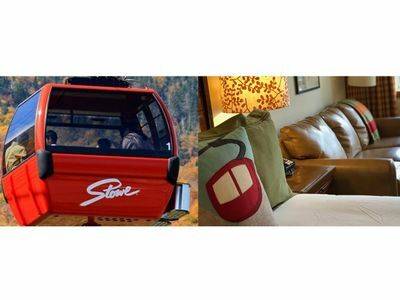 For skiers we're close to Stowe, Smugglers Notch and Jay Peak which offers several options for both alpine and Nordic skiing. 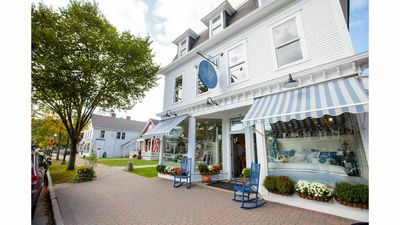 Guest's enjoy visiting Ben and Jerry's, Cold Hollow Cider Mill, Boyden Valley Winery and many other Vermont attractions, which are within a 30 minute drive. 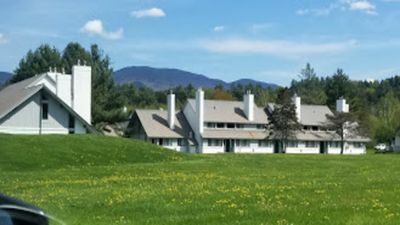 We have several of Vermont's most popular breweries within a few miles of us to include The Alchemist, Trapp Brewery, Rock Art, Lost Nation, Ten Bends and Hill Farmstead. We keep a couple growlers available for guests to use so you can bring back your favorites. For water lovers we're close to the Green River and Waterbury Reservoirs, Lake Elmore and Lake Eden all of which offer great opportunity for swimming, fishing, canoeing, kayaking and paddle boarding. We also close to the Vast Trail system for snowmobiles and being avid motorcyclist we can help plan some great area rides for guest who prefer to travel on two or three wheels. There is a great BBQ about a mile away, Black Diamond BBQ. And pizza delivery is available through Pizza on Main which is excellent. The area also has many excellent dining options and we're happy to make recommendations and discuss what's available. We live in the attached house and are available for any questions and to make recommendations for area activities, dining options and more. Guest are welcome to text, call or email for local information, tips or advice before and during your stay. 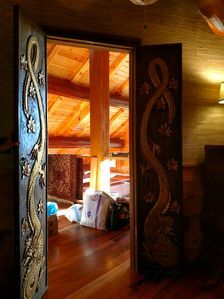 We will respect your privacy but are happy to interact with our guests. Our golden retriever Ben also enjoys interacting with guest. 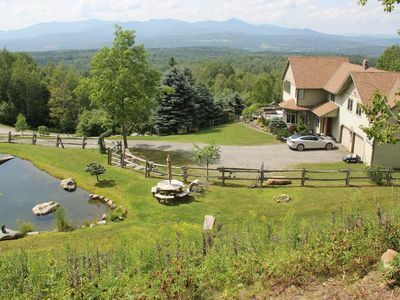 Country oasis nestled in between Stowe Mountain Resort and Smuggler's Notch. 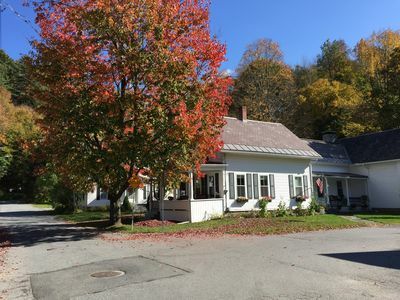 Classic 1865 farmhouse style home, renovated, in historic Stowe Village. 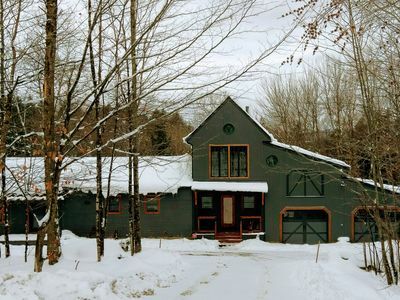 Iconic Stowe Mountain Farm, 88 acres! 6min to Downtown Stowe, 8min to Mt Road. TOP OF THE WORLD over Stowe, Hot Tub, with Tesla plug. Sleeps up to 17. 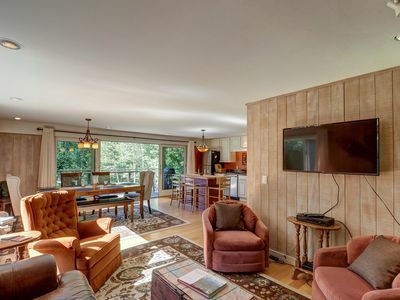 Gorgeous house with mountain views & large yard - close to skiing & more! 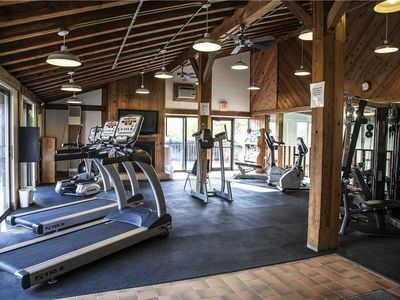 2Br/2B Condo at Village Green. 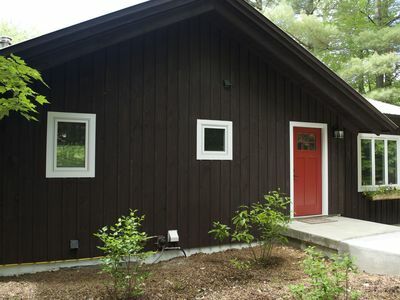 Great Location off Stowe Mountain Access Road.